In the tightly knit world of Boston medicine, the Randall family reigns supreme. When heart surgeon J. D. Randall’s teenage daughter dies during a botched abortion, the medical community threatens to explode. Was it malpractice? A violation of the Hippocratic Oath? Or was Karen Randall murdered in cold blood? The natural suspect is Arthur Lee, a brilliant surgeon and known abortionist, who has been carrying out the illegal procedure with the help of pathologist John Berry. After Karen dies, Lee is thrown in jail on a murder charge, and only Berry can prove his friend wasn’t the one who wielded the scalpel. Behind this gruesome death, Berry will uncover a secret that would shock even the most hardened pathologist. 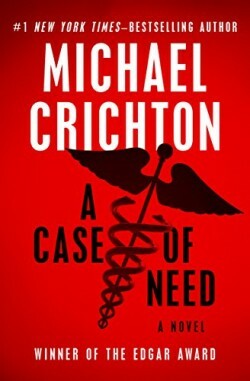 An Edgar Award–winning novel by the author of such blockbusters as The Andromeda Strain and Jurassic Park—and creator of the long-running NBC drama ER—A Case of Need is a “superb” medical-thriller mystery (Los Angeles Times).